The following paper illustrates how the Market Abuse Directive 2003/6/EC has backed up previous legislation by contemplating a new form of outlawed behaviour which an outsider may carry out by exploiting her informative advantage. After a general analysis of the features of such conduct, relevant for both criminal and administrative law, its main characteristics are underlined in a comparative perspective with US law. A schematic outline of the most critical analyses on outsider trading regulation is also carried out. 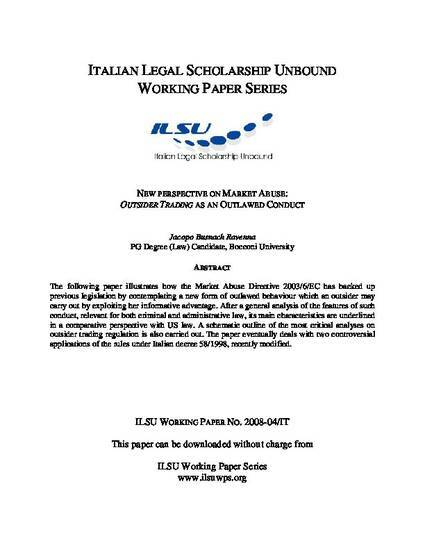 The paper eventually deals with two controversial applications of the rules under Italian decree 58/1998, recently modified.